When the bitter rivals meet at the Santiago Bernabeu, Barcelona will be looking to increase its 11-point lead on fourth-placed Real, which has played one match less. 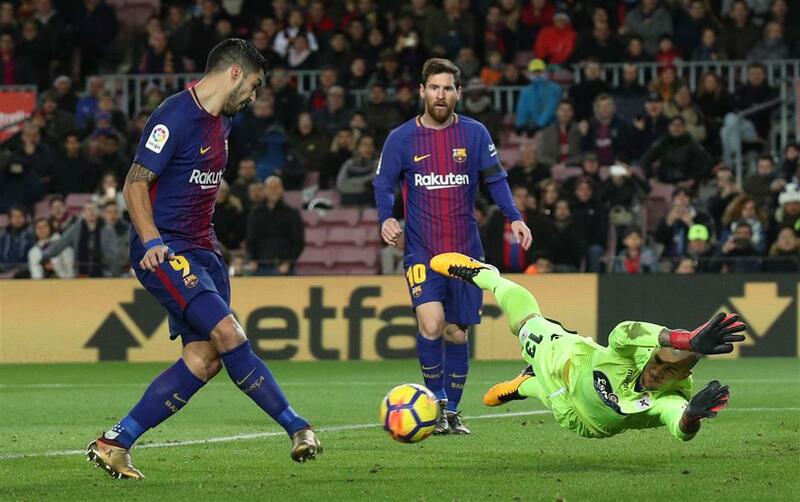 Barcelona’s Luis Suarez scores the team's first goal as teammate Lionel Messi looks on during their Spanish league match against Deportivo de La Coruna at the Nou Camp in Barcelona on December 17, 2017. The Catalans won 4-0. Barcelona striker Luis Suarez and Real Madrid's Cristiano Ronaldo were heavily criticized during the opening phase of the season but the two forwards have hit their strides ahead of Saturday's Clasico showdown between the two heavyweight clubs. Ronaldo rifled in the only goal against Brazilian side Gremio to help Real lift the Club World Cup on Saturday, while Luis Suarez struck twice as Barcelona thumped Deportivo de La Coruna 4-0 on Sunday, stretching its lead at the top of the table. Real's disappointing start to the league season was influenced by Ronaldo's poor form, although he has now turned a corner. "Cristiano is Cristiano and you must never doubt him," said defender Raphael Varane after the Club World Cup triumph in Abu Dhabi, United Arab Emirates. In contrast to Real, Barcelona is flying. Unbeaten in La Liga and the UEFA Champions League, the Catalans made light work of Deportivo in one of their best performances of the season.